Unfortunately there is no promotional scheme available on Lottoland to assist us in advertising the site. As such we have provided you with an alternative called Betfred Lotto. Just like almost everything in our daily lives, the lottery is now online. Whilst there are plenty of places to play the lottery online, Lottoland is one of the nation’s favourite. We at Mobile Bingo Bonuses love this site, the reason for which can be found below. Benefits of Playing Lottery at Lottoland! Lottoland isn’t like the National Lottery, it’s actually more like a global lottery. Their innovative ticket system actually allows you to play lottery games from around the world. So when you’ve seen the likes of U.S jackpots reach hundreds of millions and thought I’d like to win some of that! Well now you can. Rather than running out last minute to get your lottery ticket for the extremely diluted Lotto, where it seems the jackpots reduce almost weekly. You can purchase your tickets online at Lottoland, for lotteries from a variety of countries with astronomical jackpots available. You can also check your numbers online and instantly withdraw your winnings. Not only do Lottoland offer lotteries from around the world, they also give you special bonuses which you can’t get anywhere else; it’s these little extras that make a huge difference. Money Back Guarantee – Play up to 5 pay slips (ticket) and if you do not win a cash prize, then the cost of each non-winning play slip will be refunded. This promotion is only available to new players on their first purchase. Double Jackpot – Do you really fancy your chances this week? Take advantage of the double jackpot offer and you really could be quid’s in. Select this option when purchasing your lotto tickets online and if all your numbers come up, then you will double your winnings. Discounted Lottery Tickets – A lot of people weren’t happy with National Lottery ticket price increases. Well what if you could buy your lotto tickets at a discounted price? 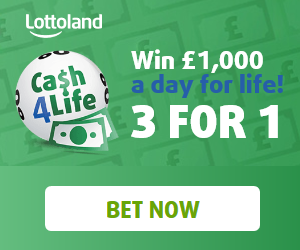 Lottoland offer every player the chance to receive a minimum 15% discount on selected lottery tickets. To get your discount all you have to do is subscribe to your favourite lotto, using the designated promo code. Lottery discount promo codes can be found in the promotions tab. There are various payment options available which include Mastercard or Visa credit / debit cards, Skrill, Neteller or uKash. If you have a Neteller account you can also make a pay by mobile deposit, by using Boku to add funds to your Neteller account. Not only can you play a variety of lotto’s, you can also enjoy a few other games. Lottoland offer players a large number scratchcards and instant win games; if you fancy something a little different. With such a large number of options available, it’s not hard to see why we love lottoland so much. So why not head on over to claim your no lose lotto ticket. If you’d like to know a little more about playing the lottery, take a look at our online lotto guide.